18K Yellow Gold earrings featuring two Tahitian pearls measuring 10-11 mm flanked with diamonds, 0.42 carats, blue sapphires, 1.95 carats and green tsavorite, 1.50 carats. 18K White Gold drop earrings featuring two Tahitian pearls measuring 10-11 mm with a diamond bar weighing 0.43 carats. Available in rose and yellow gold. 18 K White gold 20 Diamonds 0.8 Cts. 2 Sapphires 1.00 Carats Measures 1/4 "
A pair of 9mm peacock colour Tahitian pearls on an 18k white gold post, with butterflies. 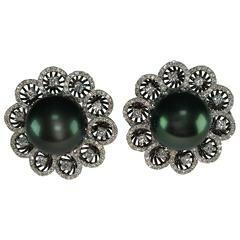 Simple stud earrings showcasing two 11.90 millimeter Tahitian pearls accented by a single round diamond. Diamonds weigh 0.31 carats total. Made in 18 karat white gold.